I had plans to go to the summit of Haleakala to observe the occultation of Saturn by the Moon, but clouds and wind kept me closer to home. I was delighted when a patch of sky opened up and I could observe the wonderful phenomenon from home. As I was observing Saturn get closer to our Moon I was struck by how small it appeared in comparison, appearing the size of some of the smaller lunar craters. 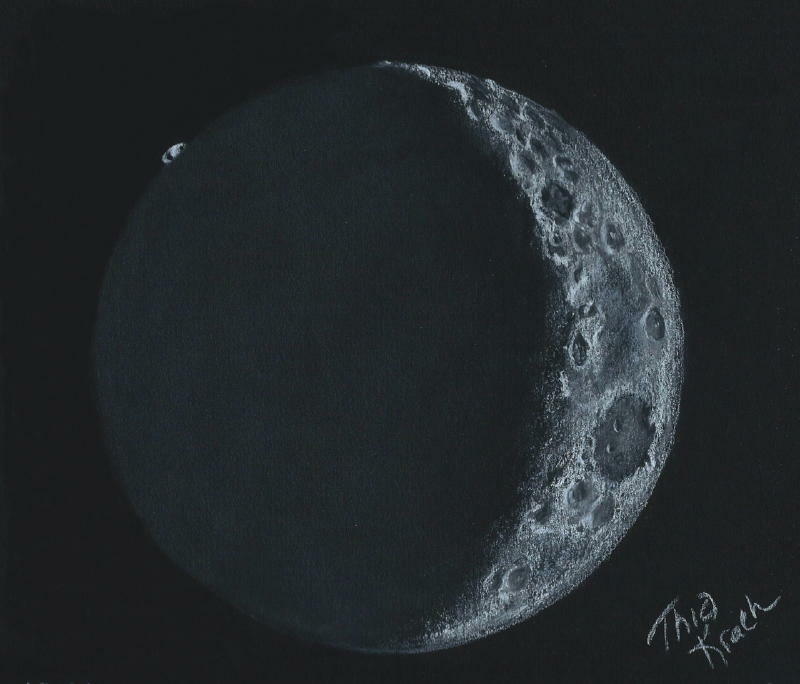 I began sketching in the details of the Moon and noticed a few stars I wanted to include. I needed to do some erasures because one of the stars was occulted ~15 minutes before Saturn, an unexpected treat. Once Saturn made it to the limb I could not clearly time the initial ingress as conditions began to deteriorate. It was however brilliantly lit in comparison to the dark lunar limb. I noted time as 19:41:36 HAST when all evidence of Saturn disappeared. My sketch is as Saturn had partially slipped past the limb. I was unable to view egress as the Moon had slipped behind clouds by this time. Hi Cindy! Haleakala Summit cleared and calmed that evening but your fine eye for detail has captured what others could not see! Great sketch! Thanks for sharing! A wonderful sketch Cindy. You have captured the essence of the event.